Driving in Pattaya can be a lot of fun until it is not anymore...all in 3 seconds. Accidents when they occur (and they do) are not that pretty most of the time. This one below was a minor accident. ...but that does not mean that everyone drives on the left! In Thailand - traffic rules are more like 'suggestions' on the road. Speaking of roads - in some places that's an exaggeration. I wonder if professional drivers train on the streets here! If You Do Get Into An Accident...What Happens? Thai police will see their role at the accident scene as an on the spot arbitrator and they will 'suggest' a suitable amount of money to change hands to settle any damage claim. From what I have heard of the expirience of others involved in accidents while driving in Pattaya....you as the foreigner are likely to be the cause of the accident. They will assume that you don't know how to drive in Thailand. Somebody else said that the Thai logic may also be that the accident would not have happened had the foreigner not been in the country. 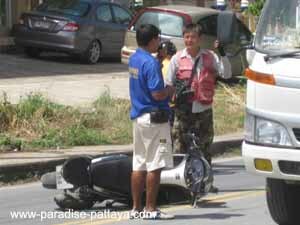 The good new's are that Pattaya's Police and ambulance services are exceptionaly good and have a fast response time. Granted maybe you don't even have to go to a hospital. A friend of mine got into a minor accident driving in Pattaya and go some road rash. You can always carry some as insurance too. If ever anything happens the sooner you treat the wound(s) the faster they will heal. What else is there to know or notice about those who drive in Pattaya? People who have the need for speed on their motorbikes or in their cars may want to consider that sometimes there are vehicles on the road that carry a whole family. 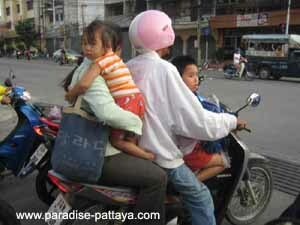 Oftentimes Thai people are not wearing helmets but I would suggest that you as a foreigner wear a helmet. Police will pull you over and fine you. Police set up checkpoints from time to time and fine Thai and Foreign violators alike. In fact some Police have proper hang out spots at these checkpoints! Either they set up camping chairs or have a little restaurant that serves coffee. Yes - I've seen both! "Thai people are peaceful, respectful and polite, right?" Right, but not when they are on a motorbike or behind a wheel. They don't show you the finger or yell at you as they do in most western countries but they certainly seem to lose the above mentioned Thai qualities when they drive. Always look out for bad drivers! There's seemingly no lack of them. Many Thais have no awareness of road rules and probably don't even have a driver's license. It is extremely easy to pass a driving test in Thailand. and you have a perfectly chaotic traffic. The legal age for driving a vehicle like cars or motorbikes is 18 years but oftentimes you will see teenagers or kids younger than this drive. Of course drunk driving is illegal and a problem in Thailand as it is in most countries, but the enforcement and penalties are not as harsh as in most countries. All that being said - have fun with your own wheels in Pattaya! Rent a Car in Pattaya Want to rent a car in this town? Here's how. Ride a bicycle Rather ride a bicycle? Discover how to get one.